From left: Wendy McMillan, Jim Thomson and Val McNab of Border Caring Services, get the desired reaction from the Borders Macmillan Centre's Amanda Fiddes, Verna Henderson, Rachel Johnson, Lesley Flannigan and Judith Smith as the giant cheque is revealed. An astounding donation of £100,000 from Border Caring Services has helped the charity behind the appeal to extend and refurbish the Macmillan centre at the Borders General Hospital soar past its target. The former care at home provider, which ceased trading in September last year, is distributing their remaining funds for the benefit of local community causes ahead of their closure. Fundraising manager for The Difference, Karen Wilson: "'To receive a donation like this that smashes our target in one fell swoop is something we never could have thought possible." Sadly, one of the long-term directors of BCS, Colin McNab, who had retired to Dunoon, recently passed away in Beatson Cancer Hospital in Glasgow. However, while in hospital, he was able to discuss the matter and gave his full support to the direction of the funds to the project. It now falls to current chair Val McNab and co-directors Jim Thomson, Gordon Edgar and finance administrator Wendy McMillan to oversee the closure of the company in the weeks ahead. Mrs McNab told us; “Border Caring Services is delighted to contribute to this development. “We hope that this is a fitting tribute to all those who have worked for and been supported by BCS over our 22 years. “We thank everyone who has touched Border Caring Services and helped us on our way through the years, including our national advisory bodies, particularly Scottish Care and the United Kingdom Care at Home Association. The Difference – the charity behind the ‘Give Us A Hand: Help Us Expand’ appeal – has reached its fundraising target much sooner than expected, thanks to the gift. 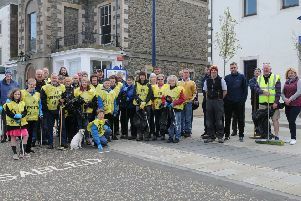 Fundraising manager for The Difference, Karen Wilson, said; “We had been really delighted with the progress of our appeal, having recently passed the halfway point in our fundraising, real testament to how, yet again, the people of the Borders have rallied behind a great cause. “To then receive a donation like this that smashes our target in one fell swoop is something we never could have thought possible. The project aims to transform the existing cancer centre in the Borders General Hospital, reconfiguring the treatment area to accommodate more patients and improve patient flow, as well as refurbish the overall look and feel of the centre itself. It is costing approximately £829,000 and Macmillan Cancer Support committed more than £400,000 with the remainder to come from The Difference. With approximately £200,000 available in existing funds, The Difference has raised more than £230,000 by the way of applications to trusts and grants as well as the public appeal it launched in November. There are still fundraising events and initiatives to take place across the region in support of the appeal so it is hoped that additional money raised will fund further enhancements to the Borders Macmillan Centre. Preliminary work on the Borders Macmillan Centre has started, with the refurbished centre expected to be completed towards the end of this year.